We live in the age of GPS, map apps, and Google Earth, an era where it takes work to not know where you are on the planet. However, during World War II, navigation and cartography were very much art as much as science. In particular, the need for accurate charts and maps was critical for military planning and operations. The National Geographic Society was a major contributor to this need for global maps and charts and has now published this excellent new book that combines maps, cartography, and history in a well-integrated bundle. Military history cannot be told well without extensive maps and this book has an excellent collection that shows the global sweep of the war through the detailed battle and campaign movements on actual maps used by commanders during the conflict. These historical maps, most part of the author’s private collection and previously unpublished, provide a fascinating glimpse into what the commanders and soldiers actually knew at the time. It may seem quant to modern readers to see colored pencil lines on maps of planned invasion beaches or how tissue paper was used to make different overlays for a campaign map, but for anyone who has struggled with navigating by dead reckoning or celestial navigation, these bring back many memories. Combined with excellently detailed maps specifically created for this volume, these artifacts present a fascinating comparison of what the combatants knew versus actual history. The book also shows how maps were not only used for military planning and navigation, but for strategic planning by the politicians on both sides, and even for propaganda, showing the victorious movements of armies. The role of maps was truly comprehensive, and, as the author notes, the supply of available charts and maps struggled to meet the demand. 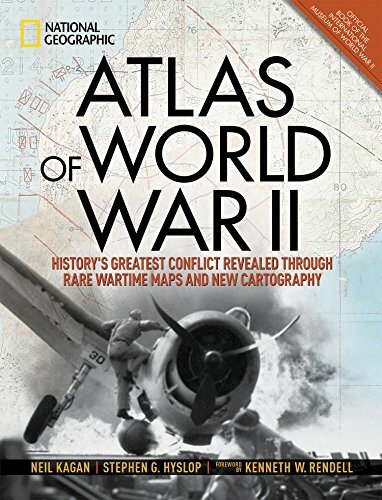 In addition to these marvelous maps, the book presents many fascinating details on the advancement of cartography during the war, in particular how the amazing new capabilities of rapidly advancing science of aerial reconnaissance photography was merged with traditional mapmaking to produce the incredibly detailed charts used for planning some of the wars most important amphibious invasions. The attention to detail and precision required for many of these maps almost makes them now seem like ancient works of art. The book also offers some interesting anecdotes as well. The most interesting was when the plane carrying Admiral Chester Nimitz and his staff got lost travelling to Guadalcanal in 1942. The map being used by the navigator did not have enough detail to determine where the aircraft was. Fortunately, one of Nimitz’s staff officers was carrying a National Geographic map produced for the public to show all the Pacific Islands that Americans might be fighting over, and the navigator was able to use this map to determine their location and direct the aircraft safely to Guadalcanal. The book will appeal to all students of World War II. The author has clearly created a labor of love and assembled a great resource for studying the role of maps and cartography in this war.